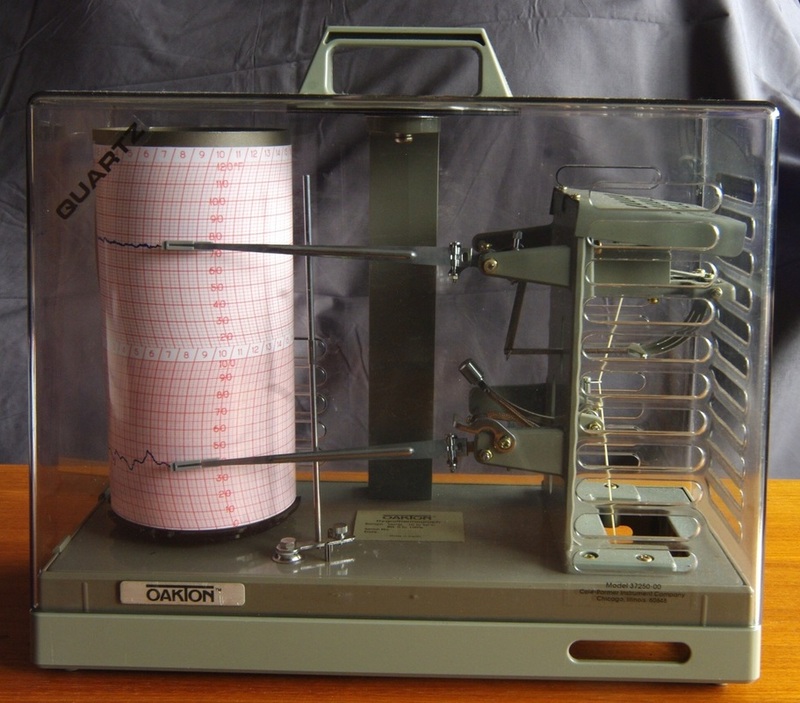 I believe this hygrothermograph was manufactured by Sato Keiryoki Mfg Co in Japan and sold by the Oakton Division of Cole-Parmer. It has a quartz clock drive which is switch-selectable with 31 day, 7 day, or 1 day rotation. The only failing is a weak battery compartment door which can pop open if you bump the instrument, stopping the drive until you close the door. Oakton also sold the identical 37250-10 hygrothermograph with 7 day spring driven drums, but I prefer the quartz drives for their flexibility and accuracy. I've used several of these and really like them. I use Oakton 8368-23 charts for 31 day mode and 8368-20 charts for 7 day mode. Go to Oakton catalog page.